The new site is clear and concise. Not too many links, all important links on one page. The download button gives you the latest version directly from addons.mozilla.org. There are some features still lacking that we will be adding in later, it was more important to just get this thing out in the open first. The holiday calendars page is still missing. Ideally the new holiday calendars area will auto-generate itself from the existing holiday files. We also wanted to show the most recent blog headlines. 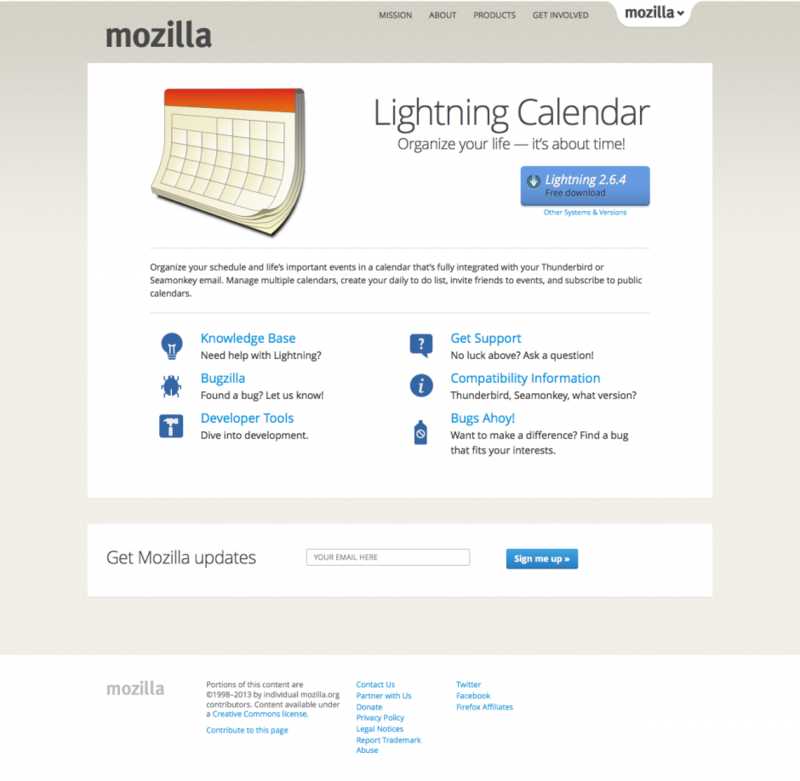 The new site is part of bedrock, Mozilla’s shiny new website framework. This means we get a lot of stuff for free, one of them is localization. I haven’t found out how this works yet, but it will be possible to translate the page into any language. Is there any information you are missing? Let us know what you think! This entry was posted on Thursday, December 12th, 2013 at 10:51 pm	and is filed under Uncategorized. You can follow any comments to this entry through the RSS 2.0 feed. You can leave a comment, or trackback from your own site. Congratulations from your ex-webmaster to you and the website team. I am trying to import google CalDAV into Lightning. All the guides I have found online direct me to File>New>Calendar>On the Network. However, the only option visible in the Windows version (8.1) is File>Open>Calendar, then it will only look for an ics file on my drive. I had downloaded ics files for each google calendar; they appeared to import just fine, but I cannot add appointments. I can’t seem to find out how to add the calendar via the CalDAV option. It seems that all the guides are only referring to the Linux version. Actually I just tried it on my Linux Mint 32 bit machine and the same menus as described above for the windows version appear. I cannot add a Calendar from “On the Network” as this option does not appear, with or without Provider for Google Calendar. just worked on the pc of a friend. He used the latest Thunderbird version and after changing an entry in his calender Thunderbird crashed and did not come up running again. We tried to reinstall the latest version without any success. I installed a previous version 24.1 and Thunderbird come up with a warning that Lightning is not compliant with the new version therefore we could disable it and deinstalled it. We migrated to Thunderbird 24.4 and said that we would like to have Thunderbird again. Final step should be to restart Thunderbird but it did not come up again. Seems having reproduced the same problem as on the beginning. We could temporary fix with deinstalling Thunderbird, installing 24.1 and not enabling Lightning so Thunderbird is running. Deleting Lightning we could migrate to Thunderbird 24.4 but no Lightning working. Seems having a problem with Lightning but don’t know where. I thought should either delete datafile for Lightning or repair the datafile for Lightning. Any version combination of https://developer.mozilla.org/en/Calendar/Calendar_Versions should work. If you want to delete the data files, consider creating a new profile. The alternative is to remove the calendar. * entries from your prefs.js and delete/move the calendar-data directory in your profile.